Most of my cooking is done within my comfort zone. Granted, my comfort zone is pretty broad thanks to my life experiences, but still. It's not my typical style to make a dish when I've never even tasted anything remotely similar to it before. However, I am a lifelong learner and I love my spouse. And my spouse, to his credit, is a sucker for a book with pretty pictures. So a long time ago, when he presented me with America: The Beautiful Cookbook by Phillip Stephen Schulz and asked me to make him pasties like he ate while growing up, I reached outside my comfort zone and gave it a shot. He's glad I did. I'm glad I did. The kids are glad I did. And you will be too. 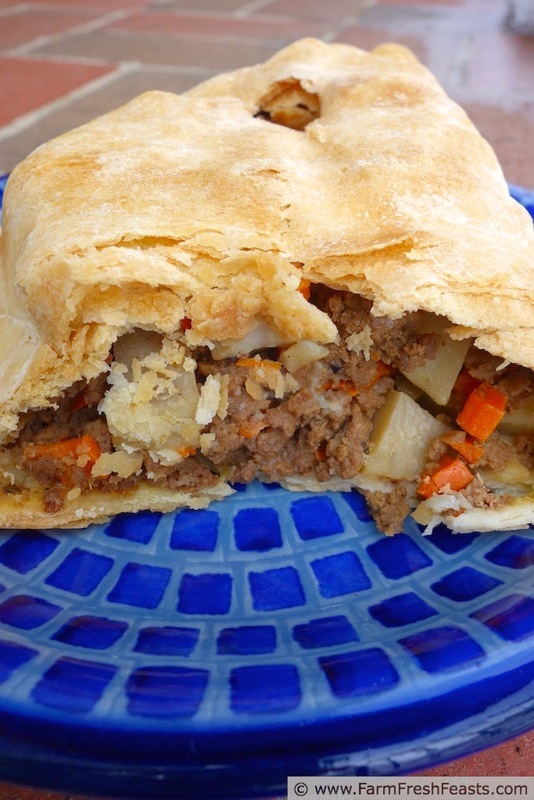 Since that first episode many years ago, I've traveled up to the Upper Peninsula and tried a real pasty. I've grown quite comfortable making them, and because pasties are a frequent visitor to our table I've even branched out a bit. 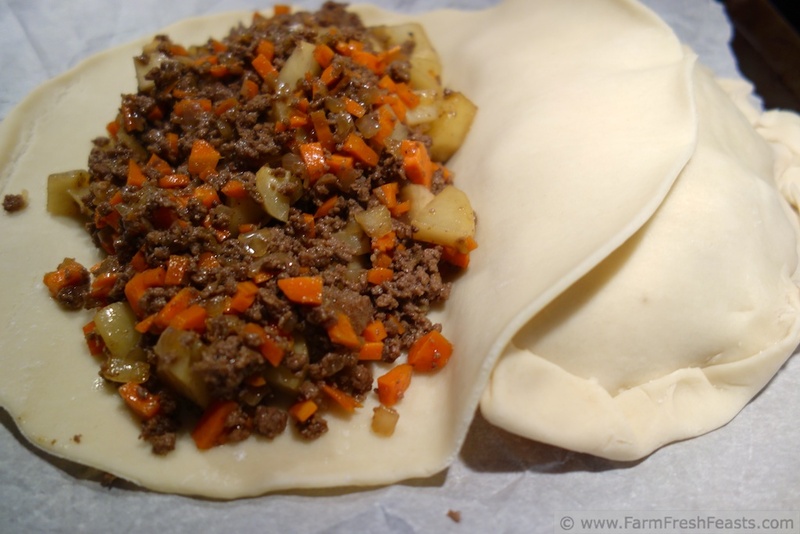 Today I wanted to share my basic pasty, because we've got a cow in the freezer, carrots, onions, and some potatoes that are not getting any younger. When I have turnips from my CSA farm share they always appear in this dish, though the primary impetus was a good deal on pie crusts from Aldi. Yes, Meghan says that this one is an easy crust. Julie says that this one is an tasty crust. Alanna says that this one is the best pie crust. You ladies are pie crust rock stars. I am still scared about the whole 'cut in chilled butter' thing, too many opportunities for failure there, so for now, if I can buy pie crust for 99 cents I'm going to stock up. Besides the fact that Pi day is right around the corner, I know that pie crust freezes just fine and with my unexpectedly defrosted fruit and vegetable freezer (see my FB page for the Lemons to Lemonade details) I had room to store. For 150 some other food blogger recipes using ground beef, please see my Ground Beef Recipe Round Up. For other recipes using carrots and potatoes, please see my Carrot Recipes Collection and my Potato Recipes Collection, part of the Visual Recipe Index by Ingredient. 2018 Pi Day Update: I made a video today while making our supper. Check out how I make my pasties! If your oven takes a while to preheat, preheat it to 450 degrees Fahrenheit now, and let your chilled crust warm up a bit so you can work it without breakage. In a large skillet (with a splash of oil), brown the ground beef over medium heat. 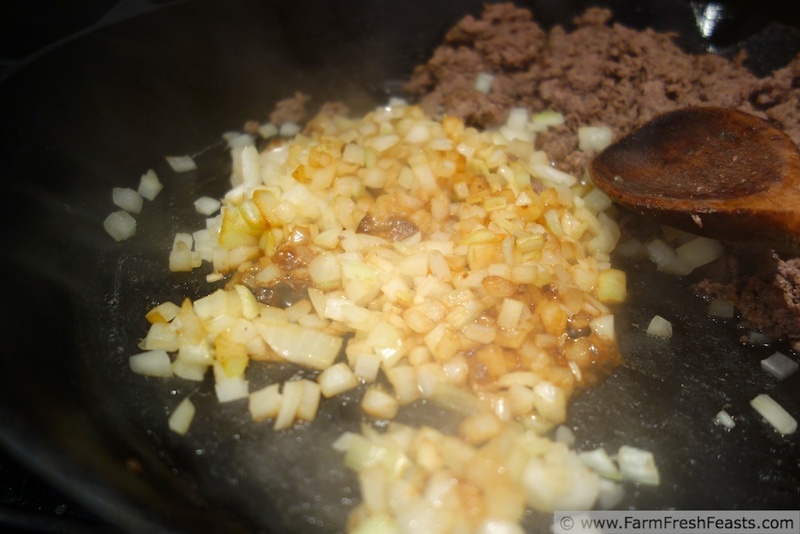 Drain fat, then add onions and bouillon cube to the ground beef in the skillet (otherwise the silly things never dissolve for me!). Sauté until onions are softened. 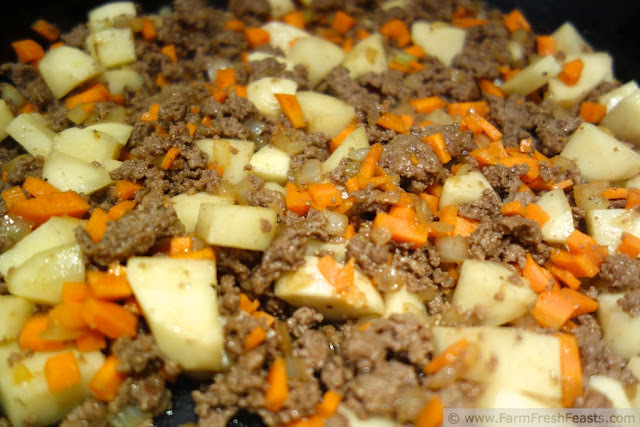 In a large bowl, stir beef, onions, carrots, potato, and spices until thoroughly mixed. On a plain ol' piece of parchment paper, lay out one crust. Fill with half of the beef mixture, then fold the crust over and crimp the edges. Repeat with the other crust (see photo below). Stab a couple of slits through the top of the crust. Slide the parchment onto a cookie sheet and place in 450 degree oven for 15 minutes. Reduce the oven temperature to 350 degrees Fahrenheit and continue baking for another 30 minutes. Remove from oven and stick a little pat of butter into those crust holes you stabbed earlier (what? you thought it was for venting? Everything's better with butter!). Serve with a hunk of cheddar cheese and a beer, eh. Are you a lifelong learner? What have you cooked out of your comfort zone? This post is shared with What's Cookin Wednesday at Buns In My Oven, What's In The Box at In Her Chucks, Taste and Tell Thursdays, the Farm Girl Blog Fest at Let This Mind Be In You, the Clever Chicks Blog Hop at the Chicken Chick, Carole's Chatter and Foodie Friends Friday. 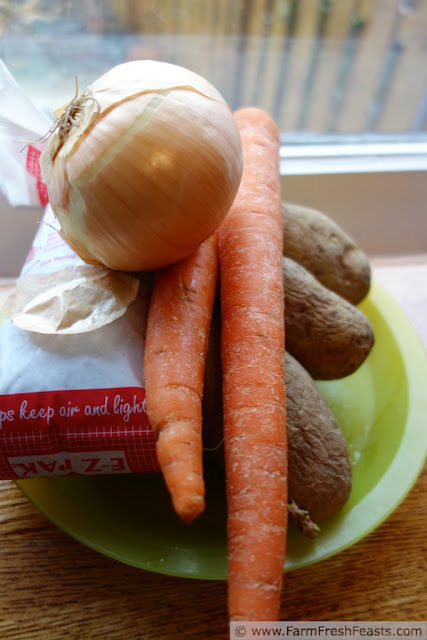 Love this bit: "Today I wanted to share my basic pasty, because we've got a cow in the freezer, carrots, onions, and some potatoes that are not getting any younger." And I swear that quiche crust is the easiest. No cutting of cold butter involved, but I understand. I buy my pizza dough for $1.99 so I can relate. Can I confess? The grocery store, after my rant about no dough, now carries bags of pizza dough. And it was marked down to 99 cents the other day, so I bought a couple of balls. For blogging purposes don't ya know. I want to do a photo essay on old veggies . . . I'm so happy to practice with cookies or cakes or anything else that uses butter. But I have a pie on the table right now, and I made the crumb topping for it, so that's a start. YUM! I have been wanting to try pasties, but the picky eaters in my household would balk. I might just have to make a tiny one for me the next time I am browning ground beef for something else. I'm glad I learned about pasties by *hearing* the name before I saw the name. Because if my spouse had simply emailed me that he wanted me to make pasties, I would have gone in a different direction. 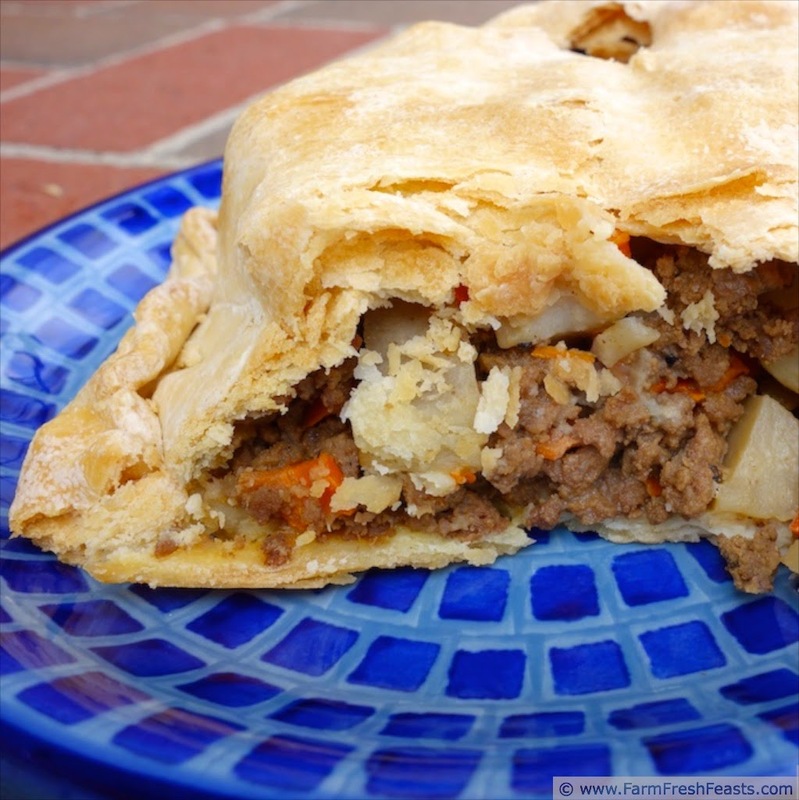 I've heard lots about pasties, but have never tried them - I love savory pies, so I know I'd love this! 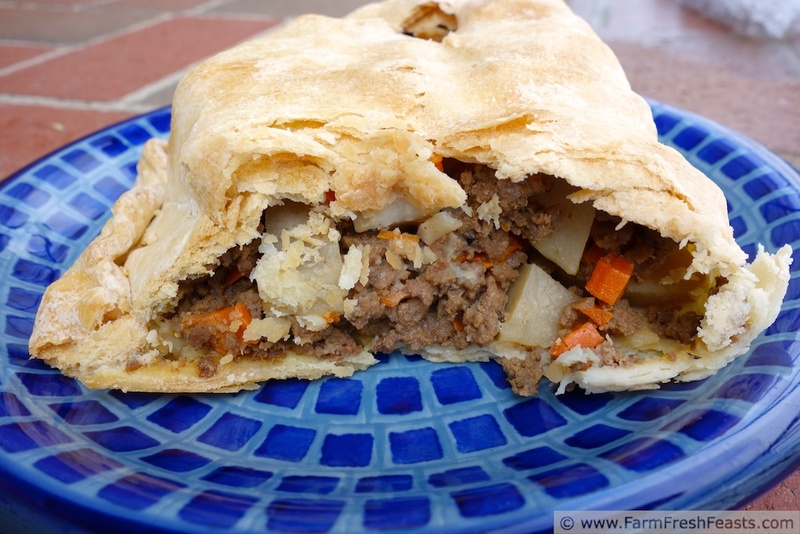 It sort of looks like a shepherd's pie in hand-pie form, which is right up my alley. YUM! It is very similar to a shepherd's pie--though my kids would pitch a fit if there were no mashed potatoes in the shepherd's pie, regardless of how you eat it. I'm with you on crust. I buy it instead. Much easier on me. Less stress. I saw you making "lemonade" with the freezer got unplugged. Your pasty looks delicious. I have never made one myself. It's probably crazy that I happily make pizza crust but balk at pie crust, but there you have it. This looks awesome. It reminded me that just a couple of weeks ago I wanted something savory stuffed in crust. Must put on my to-do list. Something savory stuffed in a crust? Oh, the possibilities! I look forward to your post on what you end up making! Such a comfort meal, it looks great!! It really is a comfort meal--now for the whole family. Funny, how things get passed down from generation to generation. Quiche with a rice crust sounds yummy to me--I threw a load of jasmine rice into the rice cooker for dinner, then got a wild hair for waffles instead (with the chicken) so now I've got cooked rice that I'll need to use somehow. I usually stick in my comfort zone, too. These look great, a great reason to step out of your zone! To be honest, it wasn't ridiculously far from my comfort zone, being meat and potatoes. Wednesday I'll be putting up a Chicken Tikka Masala recipe that is more out of my zone than this was, but I'd at least tried the final dish in Indian restaurants before so I knew what I was aiming for. Hi Kirsten, I’m Anne from Life on the Funny Farm (http://annesfunnyfarm.blogspot.com), and I’m visiting from the Farmgirl Friday Blog Hop. This looks awesome. And I love your writing style. I feel like you just gave me the recipe over the phone while you were stirring a pot and had a child clonging to your leg. Thanks for the recipe, and have a great day! Thanks so much! You just made my day! Chocolate cream pie sounds delicious to me. Our pie for dessert on Pi day came about when my daughter unplugged the fruit and veg freezer to plug in a glue gun, so we had a blueberry-peach pie with the partially thawed fruit. It was amazing (and will appear in the summer, during put-up-the-fruit season) because the crumb topping made it seem like part pie, part cobbler. Yum! I have a pastry blender, I have a food processor . . . I have the technology, just not the sisu to see it through to the finish! Thanks for sharing this. I do an olive oil crust an avoid all that chilled butter business, but it is admittedly not as flaky. I've been imagining something like this filled with lentils, rice and veggies. Thanks for the nudge! Ooh, lentils, rice and veggies sounds like it would make a delicious filling! Perhaps better for a pot pie, perhaps. (I don't know about you, but my lentils are always soupy. I need to learn to make a drier lentil without crunchiness!). Can't beat a tried and true recipe. G'day! Very warm and welcoming, TRUE! Based on your recipe and photo, I could go for some now too! Just about everything I cook is out of my comfort zone:) I just dive in and see what happens. These look delicious! I honestly don't think that I have ever had a pasty before. I like your attitude--just dive in and see what happens--I do that in the garden more than the kitchen. If you try your hand at pasties, please let me know how it turns out! Love pasties... but then again I live in the UP :)... but I am lazy about making my own and just go buy them here... I need to do it again one of these days. Thanks for sharing these on Foodie Friends Friday and to let you know I picked this as my host favorite. This will be featured over at the Daily Dish Magazine on Monday and on my blog at the next party. My spouse grew up and went to school in the UP--it's beautiful up there. We've ordered pasties, and had them shipped wherever we've lived, and they are delicious. It must be lovely to just go and buy them--like when I was in Norway and could just go and buy lefse in the shop. Wow! You know I love these already. Thanks for sharing them on FFF. It's time to do something for yourself! Even if it involves pasties, why not?